With 160mm of travel at both ends, Santa Cruz’s lower link driven VPP suspension design, and a wheelbase nearly 50 inches long for a size large, the Megatower is a big bike. But in spite of what you might be thinking, this big beast is surprisingly friendly. If you’re imagining a one-dimensional gravity sled, think again. The Megatower is Santa Cruz’s answer to the long travel 29’er segment that is currently exploding in popularity. Although you might be tempted to consider the Megatower a “Hightower on Steroids”, the truth is that the Megatower is more like a “V10 Trail”. However, don’t make the mistake of assuming that this is a one trick pony. This is a machine that climbs shockingly well and feels surprisingly nimble on the trail. For many of us, the Megatower will beg some serious questions about why you’d even want a smaller, shorter travel bike. If the Megatower were to be summed up in one word, it would be “confident”. 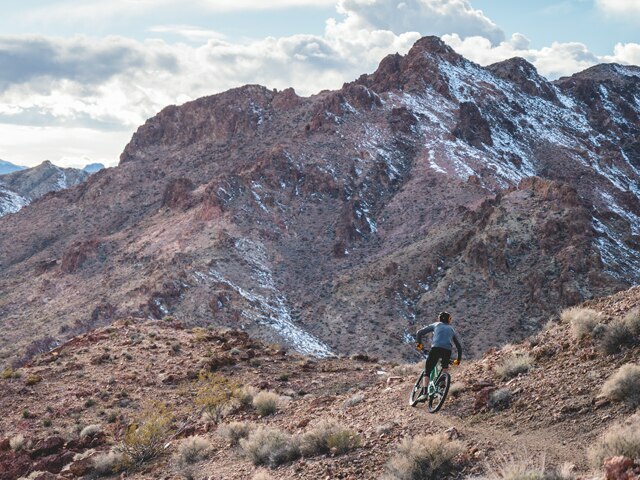 During testing at Nevada’s Bootleg Canyon, a trail system renowned for being steep, fast, unforgiving, and downright scary, there seemed to be nothing to suggest Megatower had reached its limits anywhere on the hill. For the record, our test bike was a size large, set up for a 6′ tall rider in the low bottom bracket setting and the short chainstay position. The cockpit is roomy in the way we’ve come to expect from the current generation of mountain bikes, which makes it feel immediately comfortable on the trail. 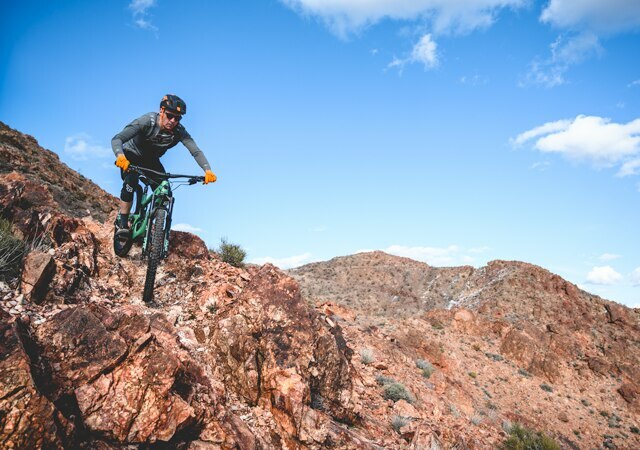 The Megatower places the front wheel far enough in front of the rider to create the impression that there is no trail steep or rough enough to upset the bike’s composure. Although the chainstays are moderately compact, the spacious front end and ensuing weight distribution contribute to the sensation that the chainstays are shorter than you might expect. As a result, it’s fairly easy to pop the front wheel off the ground, and squaring up turns at speed feels completely natural. Although it’s big, its balance is excellent, which meant that very little saddle time was required before feeling completely at home. The Megatower will surprise most riders when it comes time to climb. 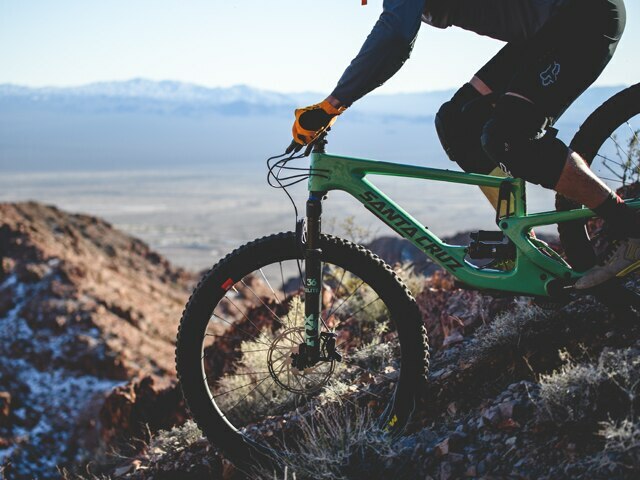 It’s not just that it climbs as well as any of its classmates in the 29 inch wheeled enduro category. Rather, the combination of the properly steep seat tube angle and the pedaling efficiency afforded by the lower link suspension design make for a bike that claws its way up steep, technical climbs with ease. 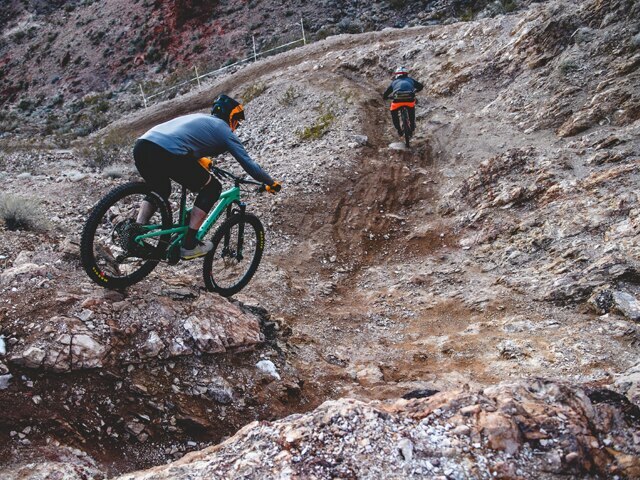 Sure, it’s long, which requires that the rider look ahead and make a game plan for tight switchbacks, but in terms of weight distribution, traction, and pedaling efficiency, this is the best climbing trail bike that Santa Cruz has ever built. Sure, a Blur TR is lighter, which lends it an insurmountable advantage during short, explosive efforts, but when it comes time to gain a thousand feet or more, the Megatower settles in and makes the job at hand simple as can be. Then there’s the cornering. Between the aggressive rider position and the traction afforded by the outstanding suspension and finely tuned chassis, turning this bike feels telepathic. The Megatower practically begs the rider to drive with the hips and look farther down the trail, making it effortless to ride very, very fast. If there’s a drawback to the Megatower, it’s that this bike does not want to go slow. Although it’s impressively balanced at track stand speed, it’s low and stable and does its best work well above 20mph, which will make it a poor fit for riders whose local terrain skews rolling and hilly rather than steep and mountainous. That said, this is a trait that’s emblematic of the breed, rather than a knock on the Megatower specifically. The geometry chart reveals some interesting departures from the rest of Santa Cruz’s lineup. This is the longest bike in the line, as measured both by wheelbase and by reach. In typical Santa Cruz fashion, the reach measurements are still slightly shorter than comparable offerings in the space. That said, the difference is modest and helps to keep the Megatower feeling like a Santa Cruz, in spite of its extra length. 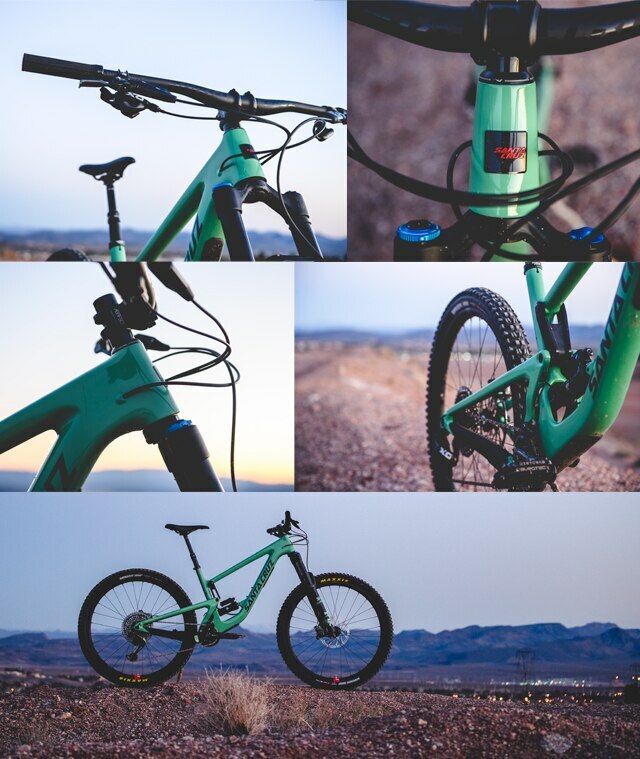 Part of the signature Santa Cruz feel is a finely tuned chassis that’s very stiff, yet has just enough give, especially in the rear triangle, to lend comfort and maximize the available traction. It’s the type of flex that’s unnoticeable until you spend time on bikes that are overly rigid, of which there are certainly a few on the market. In other words, you notice it for its smoothness, not for any unwanted flex, regardless of how hard you push it. 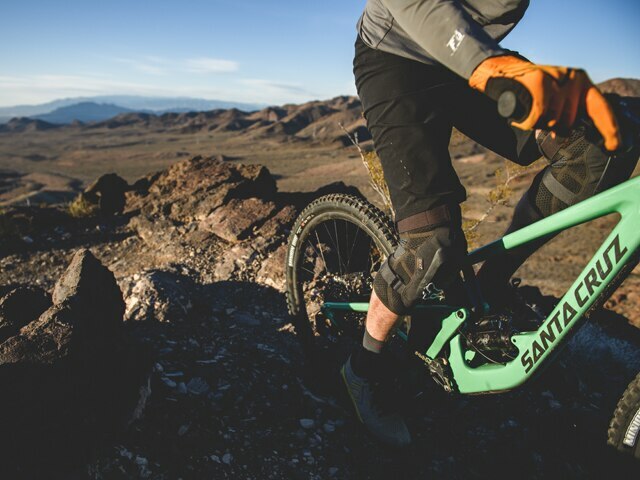 The seat tube angle is several degrees steeper than Santa Cruz’s other offerings, varying slightly between size but hovering around 76.5 degrees. This trait, perhaps more than any other single factor, is the reason that the Megatower climbs as well as it does. The seat tube is also a fair bit shorter per size than those of its siblings, allowing room for long stroke dropper posts. The chainstays are adjustable between 435mm and 445mm through a clever flip-chip system which stays in place when the rear wheel is removed. The head tube angle is adjustable between 64.5 and 65 degrees, and it’s paired with a shorter 44mm offset fork, which places it squarely on target when compared with the leaders in the Megatower’s class. The head tube angle is adjustable using a flip chip at the lower link, although the more dramatic change between settings is wheel rate, with the lower/slacker position offering a noticeably more progressive suspension feel that will appeal to aggressive riders. But in either setting, the suspension feel is more akin to the progressive feel of a Nomad than the more linear feel a Bronson. Accordingly, the Megatower should pair perfectly with a coil shock for riders who choose that option. There’s also a handful of details that are easily overlooked, yet no less important. You’ll find the same full length internally molded cable routing that has become a Santa Cruz signature, which dramatically simplifies maintenance. The threaded 73mm BSA bottom bracket is similarly friendly to the home mechanic. And although the Boost rear axle spacing is hardly noteworthy, the generous mud clearance with 29 x 2.5 inch tires should leave plenty of room for you preferred rubber. If you’re looking for the sharp end of big wheeled enduro bikes, this is it. Although it has some impressive competition, it’s hard to ignore the gut-level reaction that the Megatower is just a bit more refined, and frankly, a bit better than many of the bikes it lines up against. Not that I’m unbiased, but my first impression of the Megatower is that it’s easily a top contender, and quite possibly the leader in a class that’s defined by excellence.